I want to personally tell you the story of Hurricane Irma from within Collier County Public Schools. We began storm preparations with 10 schools ready to provide shelter for evacuees. Irma’s forecast track had her heading for the east coast. However, as Irma changed direction and headed right for Collier, the storm surge predictions became dire and the evacuation zones expanded. We quickly opened 29 schools as storm shelters housing 17,000 guests. That was 100% of available schools! Prior to Hurricane Irma, CCPS had never opened more than 10 schools as shelters. This is a 190% increase of opened shelters! For the first time, CCPS opened our doors to being Pet Shelters for dogs, cats, and even birds! All were opened within 30 hours! This required a sudden and mass effort for all CCPS departments, school-based administrators, and volunteers to get these shelter activated and keep them operational for several days. Most of these shelters had evacuees and some even housed law enforcement helping to ready our community! For example, we had various agencies staying at Oakridge Middle School and Cypress Palm Middle, such as Florida Highway Patrol, and Florida Fish and Wildlife. Barron Collier High was a staging area for all incoming resources. The National Guard took up residence at Gulf Coast High School and were responsible for feeding stations throughout the county. We had our challenges. For example, Palmetto Ridge High School, functioning as a special needs shelter for 240 residents, lost their air conditioning. The county was waiting on a part to get flown in, and it did not arrive. Collier County Emergency Management sent ten indoor air conditioning units. The person to assemble these air conditioners did not arrive. Therefore, the principal, assistant principal, and facility manager together got all 10 units up and running! We might have some new engineering teachers! I am very proud of our people doing “whatever” it takes!!! In some shelters, water mains broke, causing low water pressure. Due to power failure, the lift stations failed, causing sewage back up into the school. The cavalry came to the rescue, and port-a-potties were deployed in the morning!!!! I had the opportunity to personally witness it all as I visited 16 shelters and the County Emergency Operations Center. The most important part to remember about Hurricane Irma was how CCPS staff and volunteers came together and made our guests feel special and worked to calm those who were so worried. Our staff had activities and movies for kids, cell phone charging stations, some shelters even barbequed for guests, again going above and beyond to make people as comfortable as possible! One positive memory was seen at Gulf Coast High School. The school’s flag was stuck at the top of the flagpole before the storm and staff tried but could not get the flag down. Needless to say, the flag flew away in the storm. The National Guard saw that and did an entire flag-raising ceremony with the principal’s new flag!! Guests were all very touched as they watched! Here is another thank you note. 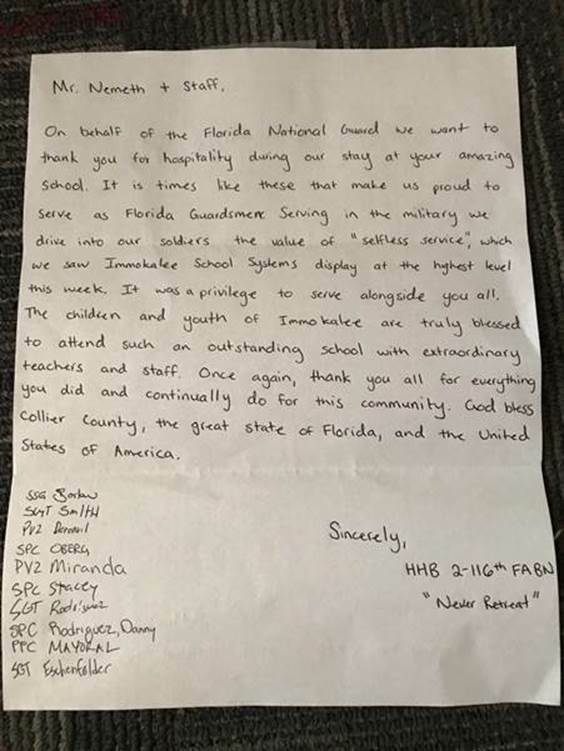 This one for Immokalee Middle School from the Florida National Guard. The principals at Corkscrew Elementary and Corkscrew Middle (the schools share a kitchen and therefore had to work extremely close) were checking their classrooms for their damage assessment reports, found this note on a white board in a room! 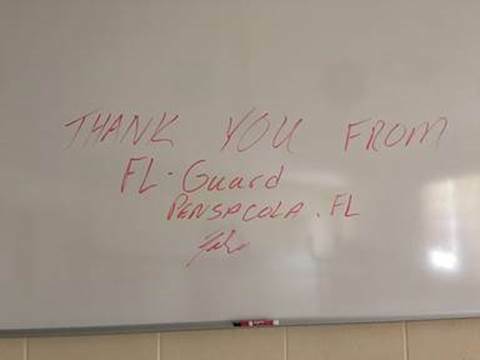 The principals at Corkscrew Elementary and Corkscrew Middle were checking their classrooms for their damage assessment reports, and found the note (pictured below) on a whiteboard in a room! This is just a small sample of the efforts during this storm. Our work was essential to keeping Collier residents safe and getting Collier County back up and running. When the schools are settled, so is the community. I want to personally thank the hundreds of dedicated Collier County Public School staff and volunteers who stood tall when our community needed a safe place to stay!